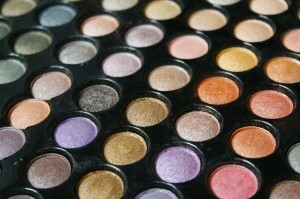 Harmful substances can be found in counterfeit cosmetics. A new campaign from the City of London Police is encouraging beauty lovers to steer clear of fake make-up. The campaign is called “Wake up – don’t fake up!” and it’s been launched following worrying reports of harmful substances in counterfeit make-up. It is estimated that we spend £90 million every year on fake products. This number is likely to increase as online auctioning sites become more popular. Fake beauty products in particular seem to be on the rise. The police have listed dangerous levels of mercury, lead, rat droppings, human urine and arsenic as substances found in fake make-up. Not only could this lead to a severe reaction, it could actually be life threatening. Fake electronic equipment, like hair straighteners, don’t go through the usual health and safety checks. This means the electric components might be faulty and could catch fire or explode. Buying beauty bits online is a favourite hobby among many make-up lovers, but how can we avoid buying the fake stuff? Auction sites like eBay make it difficult for us to know who we’re buying from. Try and only shop from official distributors and if you do shop from an auction site, check out the reviews first. If the photo looks like the stock image used on the brand’s website, ask the seller to see a photo of the product in real life. This should help you make a more informed decision when it comes to buying. Compare the packaging to the brand’s usual packaging – does it look the same? Counterfeit sellers often miss key details. Check the quality too – fake products often have lower quality packaging. Does the colour look like one the brand would normally sell? If something about the colour looks off, compare it to the rest of the brand’s offering. If the eyeshadow you’re buying comes with an applicator, but the brand doesn’t normally provide an applicator – it might be fake. Always compare to what the brand normally does, it’s unlikely that they’ll have made a change. Have you had a bad experience with fake make-up? Tell us your experience on Twitter.